RAILKO PV103 and RAILKO Xtra Glide (formerly TD1160) slip coats have been specifically developed for the automotive industry to provide the smoothest surface for glass run channels. These innovative slip coats create a low friction surface that is durable and wear resistant. Typically PV103 and Xtra Glide are co-extruded onto blends of PP, EPDM (Ethylene Propylene Diene Monomer), and S-EB-S (Styrene Ethylene Butylene Styrene) to improve long-term performances of weather seals. Glass Run Channels with RAILKO Xtra Glide slip coat can be bent during installation into the assembly frame without showing signs of scuff or mar. RAILKO Xtra Glide is the ideal solution for thin, flexible cross sections. RAILKO PV103 and RAILKO Xtra Glide (formerly TD1160) slip coats have been specifically developed for the automotive industry to provide the smoothest surface for glass run channels. These innovative slip coats create a low friction surface that is durable and wear resistant. 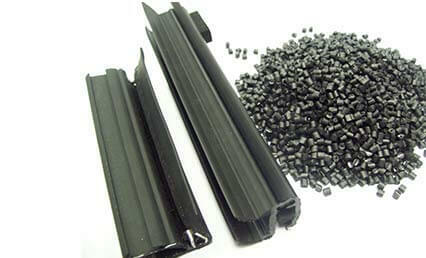 RAILKO automotive slip coats are supplied as pellets in bags of 50lb/22.7kg.